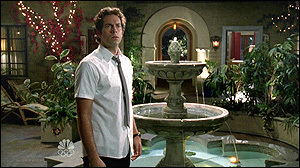 If you're a fan of the NBC show "CHUCK", you'll recognize the Spanish-style apartment courtyard where Chuck lives. And it's not in Echo Park. 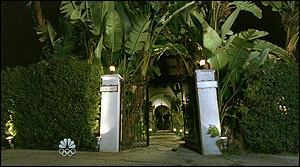 You'll actually find that familiar courtyard at 1832 Grace Avenue - at the southeast corner of Franklin & Grace, in Hollywood. Built in 1928 by Cecil B. DeMille, it's known as "El Cabrillo". It was once the home of silent movie stars, and is on the National Register of Historic Places. They built a duplicate of this courtyard as a set at Warner Bros. studio (so they don't have to trek out here all the time), but this is the original - and the red-tiled roof you see in the show's occasional aerial shots of the courtyard. And speaking of "CHUCK", you're probably wondering where his "Buy More" store is, right ? Well, it's not in Burbank. But it IS in the Valley. 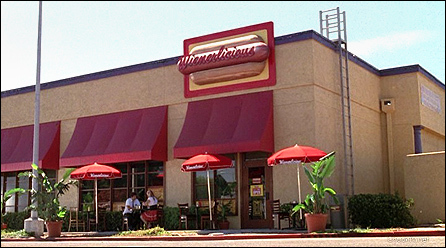 The exterior shot (above) that you see on the show is actually an old Mervyn's department store, located in the Fallbrook Center mall, at 6605 Fallbrook Ave, in West Hills (near Canoga Park). In the shot above, you are looking north, at the south side of the store. As you can see in the aerial photo below, it's a perfect match (except for the fake "Buy More" sign, of course). Mervyn's stores went out of business in 2009, and the store space now houses a Sprout's Farmers Market. Here is a Google Street View of the store. \ where Sarah worked undercover? Or, for that matter, the "Orange Orange" she worked at later? at 6501 Fallbrook Ave, in the parking lot of the same Fallbrook Mall. "Stargazer" restaurant, "Times Square Deli" and "Yankee Doodles". Here's a 2007 Google StreetView of the place. finally got married (in the 2011 season finale)? The sign outside read "First Church of Saints", but don't believe it. 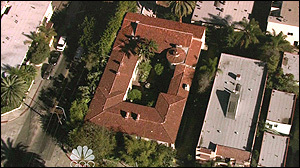 This is actually the Church of the Angels, at 1100 Avenue 64, in Pasadena, CA. 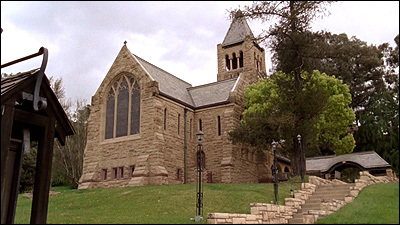 It's an Episcopal-Anglican church and was built 122 years ago, in 1889. So what about Sarah's dream house? 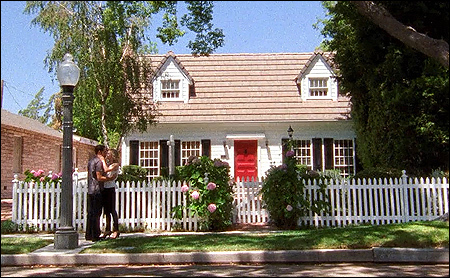 Believe it or not, it's real - right down to the red door & white picket fence. And better yet, it's actually in Burbank! north of Universal Studios and west of Warner Bros. studios. sharing a kiss that might (or might not) have restored her lost memory. This final scene was shot on Cabrillo Beach, in San Pedro, CA. between the historic Cabrillo Beach Bath House and the Cabrillo Pier parking lot. Google maps that as "Outer Cabrillo Beach" (as opposed to "Inner Cabrillo Beach"). which was shot at the same spot at Cabrillo Beach. The camera was looking north, as Chuck & Sarah faced the ocean to the south. The palm trees seen behind them line the road leading to the pier parking lot.